You want to write your emails so that they’re focused on the recipient, not focused on yourself. When you write a ‘you’ focused email, you’re writing an email focused on the other person in the conversation: the recipient, the person you’re talking to. When you write an ‘I’ focused email, you’re writing an email that focuses on yourself and talks about yourself. Review your emails to make sure that they’re ‘you’ focused. As your emails become more focused on the recipient, then you’ll see an increase in your reply rates. Let’s take a look at a live teardown of an ‘I’ focused email so you could better learn how to write emails that speak to the recipient. When we look at this email, we can see some good things… and some not so good things. 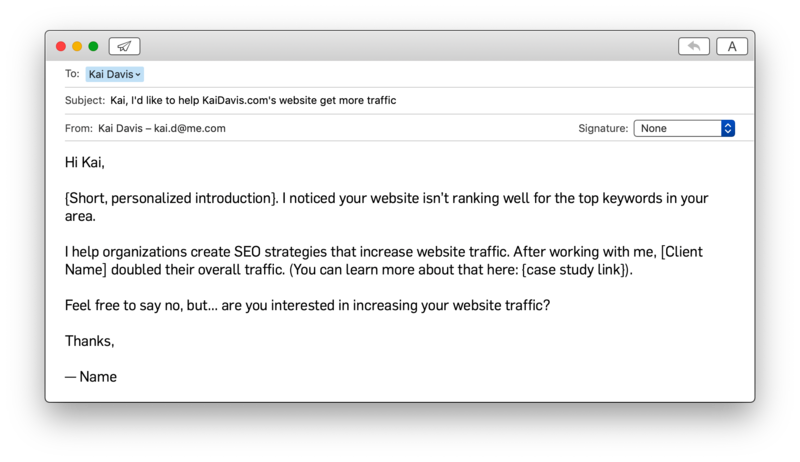 Personalization — The email is (lightly) personalized with a personalized introduction sentence, the website URL in the subject bar, and the name of the recipient. Specific — The email is specific, talking about an expensive problem that a website owner cares about (getting more traffic). Social Proof — The email shares social proof (a case-study) to let people have multiple ways to engage and sharing proof of the results they can generate. All-in-all, not a terrible email. However, the email is very “I” focused. When you look at your emails this way, you start to see the whole makeup of the email. The person who wrote this email is talking to the recipient, and they’re just really talking about themselves in the process. When you talk about yourself in an email, you’re likely boring the recipient. When you bore someone, their finger drifts towards that ‘delete’ button. If you want your recipient to be excited to receive your emails, you need to make your emails focused on the person you’re emailing, not focused on you. 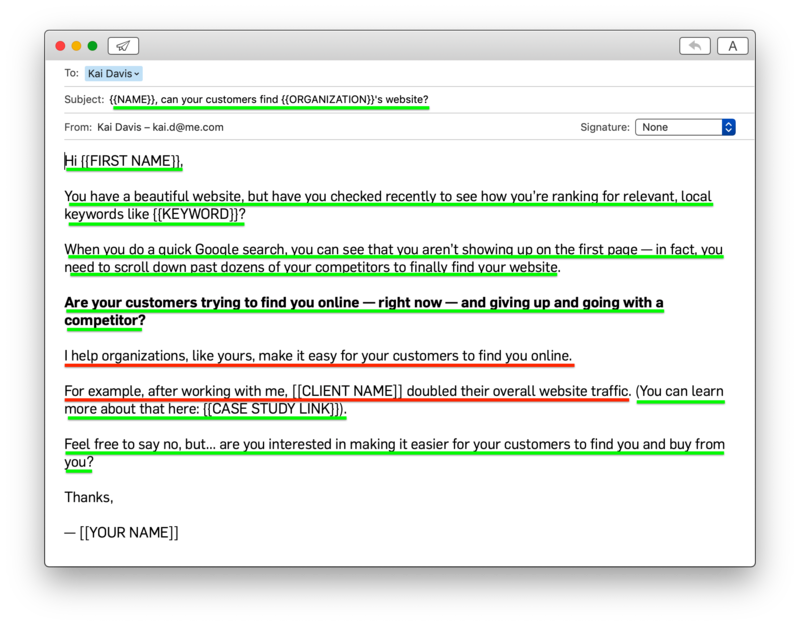 What could our above example email look like with this rewrite in mind? When you look at a ‘You’ focused rewrite of this email, you can see how by focusing on the recipient’s needs and wants (the success of their website, how they’re showing up online, if customers can find them, if they want more sales), you make your email much more relevant, persuasive, and compelling. Instead of talking about yourself, talk about the recipient, the recipient’s pains, and the outcomes the recipient is looking for. Fundamental Wants, Needs, and Pains – You need to understand the fundamental want, need, or pain that is motivating the recipient. You can learn this through Market Research and conversations with prospects in your target market. Research – How do you understand the pains people are experiencing? How do you write emails that address those pains in a ‘you’ focused way? By understanding your target market. You do that through research and by talking with prospects in your target market. You want to be talking about the person receiving the email. You want to be talking about the person who is receiving the email. You want to talk about the pains that they’re experiencing and identify with their current situation. And when you do that? People are excited to get emails from you.